Are you intimidated by the thought of cooking Asian food at home? You shouldn't be! 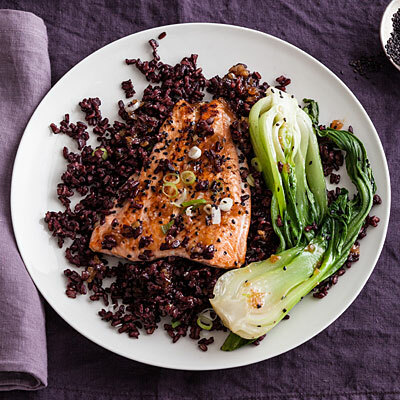 This recipe for Gingered Salmon Over Black Rice with Bok Choy looks impressive and tastes complex, but it's super easy to make. The secret to that sweet-yet-savory umami flavor comes from a mix of Asian ingredients including soy sauce, ginger, and mirin—a sweet rice wine. Salmon is high in protein and healthy omega-3 fatty acids. Pair it with black Japonica rice, which is full of antioxidants and fiber and has a rich, nutty flavor; and bok choy, a vegetable popular in Asian cuisine that's high in vitamins A, C, and K.
This dish can be adapted, so feel free to make substitutions if you need to. Brown rice can stand in for black rice without losing any of the health benefits, and bok choy can easily be swapped for spinach or kale from your local market.